This site documents my progress in building an InMoov robot. 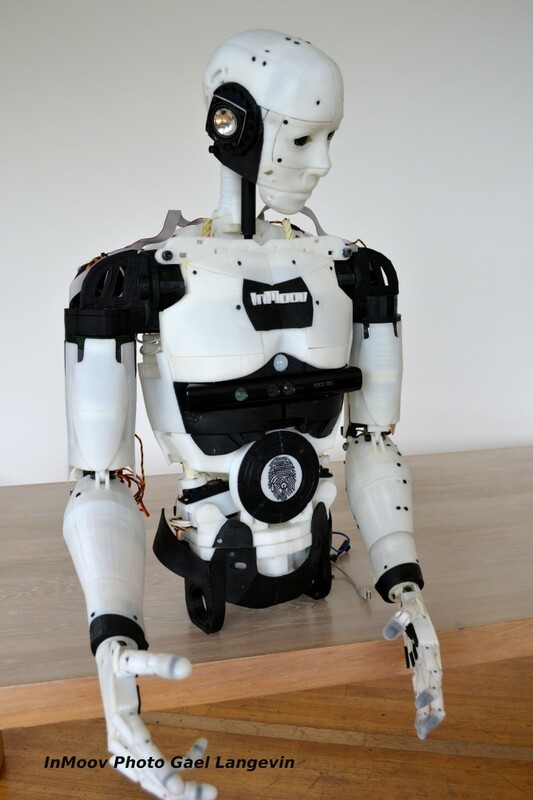 InMoov is personal project of Gaël Langevin, which he initiated in January 2012. It is the first Open Source 3D printed life-size robot. Gaël has shared his designs with the open source community and his project has been reproduced countless time around the world. I anticipate this project will take me about five years to complete. Hopefully by which time Gaël will have released the parts for the legs. Currently I'm working on the head. I have done the eyes but not yet added any cameras. Most of the skull and neck are complete. I have printed the parts for the jaw but not yet assembled it. I still have to print the sides of the head. I'm painting the visible parts with automotive spray paint. The plan is to make it white and black, the same as Gaël's original. The painting process is slowing me down a lot. The head is now complete but some parts still need painting and I have not yet added a camera. I have had the eyes moving controlled with an Arduino and MyRobotLab. Construction of the upper torso is well underway.The basic frame is in place and at some point I need to printer some covers for the chest and back. Check out the torso video here. The next stage is to print the neck piston. These should be complete by mid 2018.